A Laboratory Information Management System (LIMS) is software that allows you to manage samples, test results and associated data to improve lab productivity. 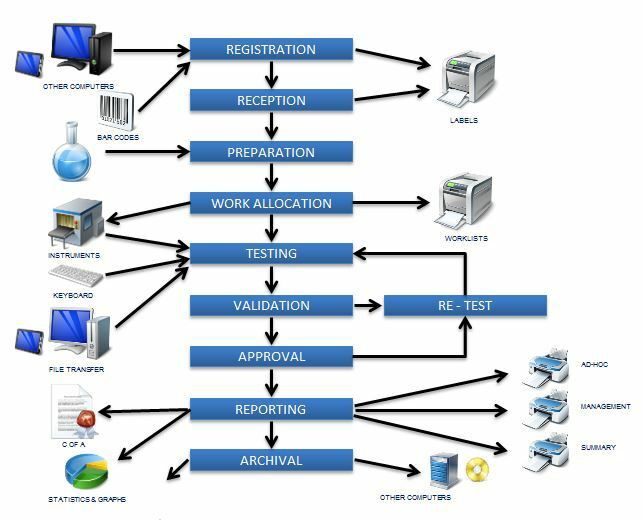 What is a Laboratory Information Management System? A Laboratory Information Management System (LIMS) allows you to effectively manage the flow of samples and associated data to improve lab efficiency. A LIMS helps standardize workflows, tests and procedures, while providing accurate controls of the process. Instruments may be integrated into the LIMS to automate collection of test data, ensuring they are properly calibrated and operated by trained staff only. The audit and revision control functions in a LIMS are key reasons why people use a LIMS and ‘go paperless’. Unlike a spreadsheet changes to results are logged, as well as any changes to the test procedure, instruments and reagents used and so on. What are LIMS used for? There will be differences between LIMS systems depending on the manufacturer, such as mobile-access, customization options and the level of technical support required. A LIMS are commonly used in Sample Management to keep accurate records of each sample. Detailed information can be recorded when the sample is created or first arrives in the lab, which can be enhanced and expanded throughout its lifecycle. This normally includes the source of the sample, the names of the lab researchers working on it and which parts of the workflow it has passed through. It also includes information such as how it should be stored and any expiration dates. Using a LIMS to hold this information reduces the risk of a sample becoming lost, contaminated or expiring. Keeping track of inventory is an important part of day-to-day lab management. A LIMS system can fully automate this process, ensuring that supplies are ordered in advance according to requirements. This keeps the lab workflow moving and prevents delays or issues arising from a lack of stocks. LIMS are an essential tool to maintain accurate and timely reporting. The system can automate many daily, weekly and monthly reporting tasks. Additionally, ad-hoc instant reports can be quickly run, allowing lab workers to make informed real-time decisions. What is more, readings can be taken directly from equipment and fed directly into the system to produce reports with the highest possible accuracy. A LIMS can be used to streamline the laboratory workflow, from automatically assigning tasks to researchers to outlining where a sample needs to be passed to for its next step in the workflow. It can even be programmed to suggest instruments and equipment, based on pre-set rules and criteria. LIMS are used by laboratory workers and support staff of all disciplines. Every lab can benefit from a LIMS, however they’re commonly found in medical, pharmaceutical, environment monitoring, manufacturing and quality assurance labs. LIMS software helps labs meet regulatory requirements such as GMP, FDA 21CFR Part11, GLP by encapsulating what they do and how they do it, enabling efficient management of the lab. LIMS solutions can be developed in-house or bought commercially. LIMS solutions enable labs to concentrate on what they do best (the science) rather than spend resources developing bespoke solutions that can be hard to validate and maintain. The best LIMS solutions adapt to the way you work, help you manage the lab to efficiently provide your customers with exactly what they want (high quality traceable results), and create an automated repeatable bulletproof process. Autoscribe Informatics LIMS solutions not only do all this but also encapsulate Notebook (ELN or electronic laboratory notebook) functionality enabling team collaboration by keeping searchable notes online. It also incorporates all the functionality traditionally found in a LIS (laboratory information system), which is typically used in clinical environments for patient records, as well as the storage and chain-of-custody requirements associated with biobanking and forensic laboratory needs. Find out more about Autoscribe Informatics LIMS solutions.